A number of great sites have reported this already, but when it comes to news about anything related to Final Fantasy Tactics old news is still good news. 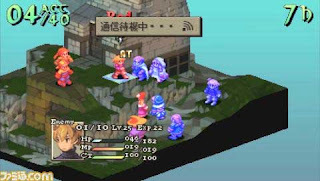 Apparently the PSP retooling of the classic Square-Enix SRPG will be featuring online multiplayer battles. Players start off by setting up options like trap placement or removal. Once battles begin, each side is given a set number of moves--if one player fails to defeat the other by the time the moves have been used up, the game ends in a draw. Probably not a feature I'd use, but it's interesting nonetheless!